NBC recently renewed Revolution for a second season, although its ratings performance since the show’s March 25th return continues to be revolting. The Peacock again dominated the first two hours of prime-time Monday, with The Voice averaging 344,210 D-FW viewers while ABC’s second-place Dancing with the Stars had 234,063. NBC also sang an aria among advertiser-prized 18-to-49-year-olds, with The Voice soaring to 210,500 viewers in this age range while CBS’ How I Met Your Mother and 2 Broke Girls took the silvers ahead of DWTS from 7 to 7:30 p.m. and 8 to 8:30 p.m. DWTS also was outdrawn in this key demographic by Fox’s season finale 8 p.m. episode of The Following. Then came Revolution, which plunged to 130,800 total viewers at 9 p.m., with just 54,220 in the 18-to-49 motherlode. That put it fourth in total viewers and third among 18-to-49-year-olds, where it beat only Fox4’s local newscast in the 9 p.m. hour among the Big Four broadcast networks. Here’s another intriguing ratings sidebar. KTXD’s (Ch. 47) repeat of The Wild Wild West drew 48,189 total viewers in the 3 p.m. slot. Only NBC5’s syndicated Ellen did better at that hour with 68,842 viewers, according to Nielsen. Even more surprisingly, Wild Wild West ran a closer second to Ellen in the 18-to-49 demographic. Contrast this with the continued “hashmarks” (no measurable audience) for D magazine’s 9 to 11 a.m. D: The Broadcast on Ch. 47. But as soon as it ended, the station showed ratings pulses from 11 a.m. to 6 p.m. for its evergreen lineup of Hawaii Five-0, Gunsmoke, Bonanza, Big Valley, Wild Wild West, Emergency and The Rifleman. Another local Ch. 47 production, the baby boomer-aimed Texas Daily, then barely registered with 688 total viewers in the 6 p.m. hour. CBS11 had the most total viewers at 10 p.m. while slipping to a close second behind Fox4 among 25-to-54-year-olds, the main advertiser target audience for news programming. Fox4 as usual swept the 6 a.m. competitions, with NBC5 pulling into second place ahead of WFAA8 in both measurements. The 6 p.m. firsts were split between CBS11 in total viewers and Fox4 in the 25-to-54 demographic. At 5 p.m., WFAA8 won in total viewers and NBC5 had the most 25-to-54-year-olds. New episodes of CBS’ regular series lineups swept both the Sunday and Friday prime-time Nielsens on D-FW total viewer scorecards. But with an asterisk when Friday’s off-network Texas Rangers game is factored in. CBS’ Sunday night leader, The Mentalist, drew 240,947 viewers in the 9 p.m. hour. Likewise running first from 6 to 9 p.m. were 60 Minutes (185,873), The Amazing Race (199,642) and the season finale of The Good Wife (also with 199,642 viewers). Amazing Race also won its time slot with advertiser-prized 18-to-49-year-olds, as did the second half-hour of 60 Minutes. The golds in this key demographic otherwise went to Fox’s The Simpsons from 6 to 6:30 p.m. and NBC’s All-Star Celebrity Apprentice in the 8 to 10 p.m. hours. In Friday night’s total viewer results, CBS ran the table among the Big Four broadcast networks with Undercover Boss (220,294), Vegas (206,526) and Blue Bloods (275,368). Among 18-to-49-year-olds, the golds went to Undercover Boss, ABC’s Shark Tank and Blue Bloods. However, prime-time’s overall high roller was the Texas Rangers, whose win over Minnesota on TXA21 topped Friday’s 8 to 10 p.m. hours in both total viewers and 18-to-49-year-olds. The game overall averaged 213,410 total viewers, ranking ahead of the Saturday and Sunday afternoon Ranger losses on Fox Sports Southwest (144,568 and 185,873 total viewers respectively). The President Obama/Conan O’Brien portion of the White House Correspondents dinner Saturday night drew 13,768 total viewers on CNN. The dinner’s other longtime carrier, C-SPAN, does not subscribe to Nielsen. CBS11 swept the 10 p.m. competitions in both total viewers and 25-to-54-year-olds, the main advertiser target audience for news programming. Fox4 did likewise at 6 a.m., a time period it has dominated throughout 2013. CBS11 had the most total viewers at 6 p.m., but WFAA8 ran first with 25-to-54-year-olds. The 5 p.m. spoils were split between NBC5 in total viewers and Fox4 in the 25-to-54 demographic. Thursday was super-busy for keepers of Nielsen scorecards. On the first day of the May “sweeps” ratings period, Round One of the NFL draft clashed with a Texas Rangers game while morning and afternoon hours were dominated by live coverage of the George W. Bush Presidential Center and the West, TX memorial service in Waco. Let’s sort it all out for you. The first-place Rangers’ 2-1 road win at Minnesota, on Fox Sports Southwest, began directly opposite the draft on ESPN. The game ended between 10 and 10:15 p.m. while the draft droned on, particularly for Cowboys’ fans staying up late to see what the team would do with its traded-down 31st pick. The draft’s numbers from 7 to 10:15 p.m. were an average of 123,916 viewers with a high point of 165,221 between 9:30 to 9:45 p.m. But the draft’s biggest audience came post-Rangers, with 206,526 viewers on hand between 10:15 and 10:30 p.m. (when the Cowboys made their pick). Overall, though, score a comfy win for the North Texas Nine. The Rangers came up well short of the draft, however, among advertiser-prized 18-to-49-year-olds. In that key demographic, the NFL flexed with an average of 89,303 viewers between 7 and 10:15 p.m. before hitting a peak of 149,902 in the 10:15 to 10:30 increment. The entire Rangers-Twins game averaged 47,841 viewers in the 18-to-49 age range, with a high of 89,303 from 10 to 10:15 p.m. So no contest here. Earlier Thursday, Fox4, NBC5, WFAA8 and CBS11 all offered live continuous coverage of the Bush library dedication, which started at 10 a.m. and ran until 11:16 a.m. Let’s look at the total viewer Nielsen numbers from 10 to 11:15 a.m.
WFAA8’s coverage also had the most 25-to-54-year-old viewers (main advertiser target audience for news programming), followed in order by Fox4, NBC5 and CBS11. By mid-Friday afternoon, Fox4, NBC5 and CBS11 all were offering continuous, commercial-free coverage of the West, TX memorial service while WFAA8 broke in only for President Obama’s remarks (3:54 to 4:10 p.m.) and otherwise stayed with its syndicated trio of Anderson Live, Dr. Oz and Katie. NBC5 likewise led among 25-to-54-year-olds, with WFAA8, Fox4 and CBS11 trailing in that order. OK, let’s move to Thursday’s prime-time numbers, where the Big Four broadcast networks celebrated the start of the season’s final sweeps period with all-new episodes of your favorite and not-so-favorite programming. CBS’ The Big Bang Theory ran first from 7 to 7:30 p.m. in total viewers before the second half-hour of Fox’s American Idol won from 7:30 to 8 p.m.
CBS’ Person of Interest and Elementary then controlled the 8 to 10 p.m. slot. Big Bang also won with 18-to-49-year-olds while the second half of Idol barely held off CBS’ Two and a Half Men to top the 7:30 to 8 p.m. segment. ABC’s Grey’s Anatomy ran first with 18-to-49-year-olds in the 8 p.m. hour, with Elementary winning at 9 p.m. NBC’s fourth episode of Hannibal had its worst outing to date, running sixth at 9 p.m. in both audience measurements behind CBS, ABC, Fox4’s local newscast, the Rangers game and the NFL draft. In the local newscast derby results, WFAA8 got off to a splendid start on Day One of the sweeps -- with sweeps of the 5, 6 and 10 p.m. competitions in both total viewers and 25-to-54-year-olds. Fox4 collected its usual golds with twin wins at 6 a.m.
WFAA8 acted alone Thursday afternoon. And its decision to mostly ignore the West, TX memorial service at Baylor University in Waco remains puzzling if not inexplicable. D-FW’s three other major TV news providers -- Fox4, NBC5, CBS11 -- all carried the service live and in its entirety. It consumed just over two-and-half-hours, ending at 4:52 p.m. Thursday. WFAA8, which not so long ago touted its willingness to “cross state lines” in pursuit of a story with a solid local angle, interrupted regular programming only for President Obama’s remarks. The President, who with First Lady Michelle Obama stayed for the complete service, spoke from 3:54 to 4:10 p.m. WFAA8 then immediately cut back to Katie, whose featured guest was Celine Dion. The ABC affiliate also ran its regularly scheduled syndicated 2 to 4 p.m. lineup of Anderson Live (which has been canceled for next season) and Dr. Oz. WFAA8 news director Carolyn Mungo has not returned an email, sent several hours ago, asking for an explanation of why the station did what it did. The memorial service was streamed on wfaa.com, but one first had to sit through a commercial. There also were problems with the video, which ran behind the live, commercial-free televised coverage on Fox4, NBC5 and CBS11. Earlier Thursday, WFAA8 saw fit to air a live one-hour warmup show for the dedication of the George W. Bush Presidential Center. That makes its virtual blow-off of the West, TX memorial service all the more bizarre. Fox4, NBC5 and CBS11 didn’t have 9 a.m. warmup shows, but otherwise joined WFAA8 in carrying the Bush event live and commercial-free. The cable news networks -- CNN, Fox News Channel and MSNBC -- cut to the President’s address from Waco while otherwise spending their time on other news stories. But that’s to be expected. They’re national news services. What was totally unexpected was WFAA8’s decision to largely take a pass on an event that basically occurred in its own backyard. Waco is just a 90-minute road trip from Dallas. WFAA8 decided to ignore the very moving testimonies from survivors of those who died while fighting the massive fires in West, TX. 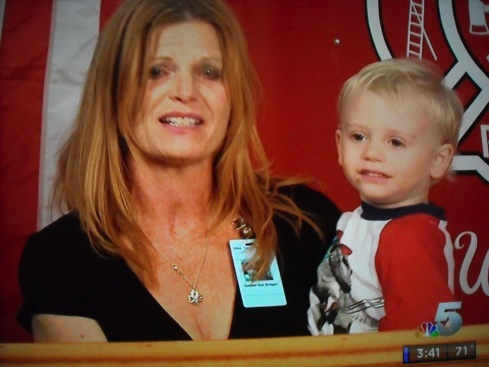 The above picture, of a widow and little boy who lost their husband/father, was just one of the many emotional moments. Viewers of Fox4, NBC5 and CBS11 had the opportunity to see them all. So did the President and First Lady, who cared enough to stay the course in a state that decisively voted for their Republican opponents in both the 2008 and 2012 elections. WFAA8 was soundly beaten by Fox4 in the local Nielsen ratings and edged by CBS11 during the continuous April 17th breaking news coverage of the West, TX tragedy. It used to be a given that WFAA8 would dominate its rivals under such circumstances. Its hands-off handling of Thursday afternoon memorial service won’t help WFAA8 to burnish its news reputation. The station chose Anderson Live, Dr. Oz and Katie at times when all three of its rivals knew where to go and what to do. Yes, anyone who wanted to see the complete West, TX memorial service had ample options Thursday. But that one of those options wasn’t WFAA8 is still a considerable shock to the system. 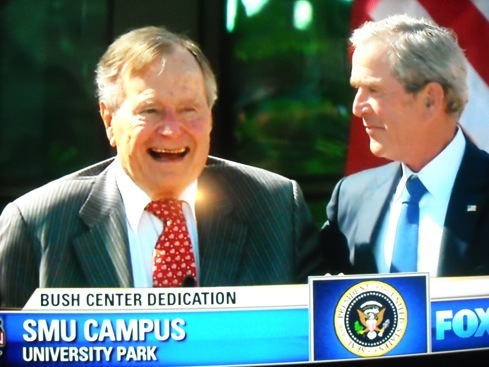 D-FW’s four major TV news providers all interrupted entertainment programming Thursday morning for live coverage of the George W. Bush Presidential Center dedication. They were joined at the network level by CNN, MSNBC, C-SPAN and a surprisingly late Fox News Channel, which skipped the preliminaries, including Laura Bush’s remarks to an invitation-only crowd on the SMU campus. The ceremony started just before 10 a.m. and ended at 11:17 a.m. on a sunny, picture-perfect morning. Fox4, NBC5, WFAA8 and CBS11 all relied on a pool camera feed, but also had their own reporters in place for post-mortems. WFAA8 began its coverage an hour early at 9 a.m., preempting Good Morning Texas. The station’s Ron Corning and Gloria Campos co-anchored from the scene. Both George H.W. and Jimmy Carter are 88 years old, making them long shots to attend any future presidential center dedications. This one also included former president Bill Clinton and President Barack Obama, with all five spouses likewise in attendance. That’s an unusually large contingent. As the honoree noted, it also marked the first time that both parents of a former president had lived long enough to see their son’s library officially dedicated. The networks celebrated May “sweeps” eve with a cavalcade of reruns Wednesday night. Only Fox completely abstained with its usual two-hour chunk of American Idol. It allowed Fox to win the 7 to 9 p.m. hours with 344,210 D-FW viewers. But CBS’ only new entry, Survivor: Caramoan, was competitive from 7 to 8 p.m. with 234,063 viewers. ABC’s only first-run attraction, How to Live With Your Parents (For the Rest of Your Life), was also its most-watched show with 89,495 viewers at 8:30 p.m. That still put it in fourth place in total viewers and fifth (behind CW’s Supernatural) among advertiser-prized 18-to-49-year-olds. Fox4’s local newscast comfortably won the 9 p.m. hour with 227,179 viewers opposite repeats on ABC, CBS and NBC. It was the same story in the key 18-to-49 demographic. The Texas Rangers’ 11-3 thrashing of the Angels, with Yu Darvish pitching a scoreless 6 innings and striking out 11, averaged a very nice-sized 213,410 total viewers even after losing steam as the game went past midnight. The game’s peak audience on Fox Sports Southwest was 323,557 viewers between 10:15 and 10:30 p.m. In local news derby results, WFAA8 edged CBS11 for the top spot at 10 p.m. in total viewers. But Fox4 and CBS11 tied for the lead at that hour among 25-to-54-year-olds, the main advertiser target audience for news programming. Fox4 again swept the 6 a.m. Nielsens, although its margin was narrow in total viewers, with WFAA8 a close second. The 5 p.m. wins also went to Fox4, which added a 6 p.m. first with 25-to-54-year-olds. CBS11 had the most total viewers at 6 p.m.
Splash went pretty swimmingly for ABC at first. But Louie Anderson going kerplop no longer seems to be enough. The celebrity diving competition’s March 19th premiere drew 192,758 D-FW viewers, with 76,546 in the advertiser-prized 18-to-49 age range. Tuesday’s 7 p.m. edition dove down to respective totals of 123,916 and 28,705 viewers. That put Splash in its rightful place -- fourth in both ratings measurements among the Big Four broadcast networks. Actually fifth in the 18-to-49 demographic, where it also was outdrawn by The CW’s Hart of Dixie. A new episode of CBS’ NCIS as usual led the prime-time pack with 536,968 total viewers, besting NBC’s potent competing results edition of The Voice (433,705 viewers). CBS also won at 8 p.m. with NCIS: Los Angeles (392,399 viewers) before ABC’s Body of Proof nipped CBS’ Golden Boy by a score of 234,063 viewers to 227,179. The 7 to 10 p.m. laurels among 18-to-49-year-olds went to The Voice, NCIS: Los Angeles and Body of Proof. On Fox Sports Southwest, the Texas Rangers’ late-starting, extra inning road loss to the Angels averaged 172,105 total viewers. In Tuesday’s local news derby results, WFAA8 warmed up for the May “sweeps” (which start early on Thursday) with its second straight pair of dominant 10 p.m. wins in total viewers and 25-to-54-year-olds, the main advertiser target audience for news programming. Fox4 as usual swept the 6 a.m. competitions while also running the table at 5 p.m. The 6 p.m. firsts went to CBS11 in total viewers and WFAA8 among 25-to-54-year-olds. 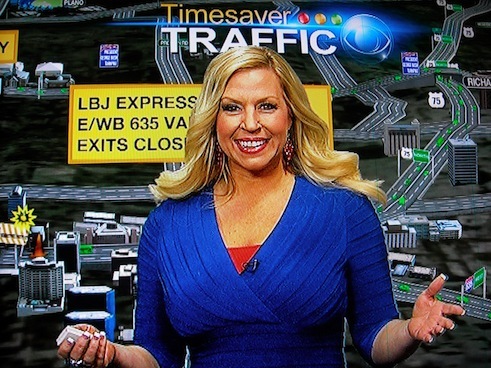 Veteran D-FW traffic reporter Tammy Dombeck is picking up speed at CBS11. Although still a free-lancer, she’s now the new weekday travel guide on the stations 4 and 5 p.m. newscasts. CBS11 communications director Lori Conrad confirmed the promotion Tuesday. It will be the first time the station’s late afternoon and early evening newscasts have had regular traffic segments, Conrad said. Dombeck also has been spreading the news on her Twitter and Facebook pages. After 12 years as rival station NBC5’s a.m. traffic anchor, Dombeck left in July of last year after the two sides failed to reach agreement on a new contract. After six months off the air, in accordance with a “non-compete” clause, she began filling in on CBS11’s early morning newscasts on March 4th. NBC’s long layoff of The Voice didn’t dampen its ratings power. But that same strategy may have served to kill the serial drama Revolution in much the same way that the Peacock shortened the life span of Heroes. The Voice as usual flexed from 7 to 9 p.m., whipping ABC’s competing Dancing with the Stars in total D-FW viewers (413,052 to 282,252) and squashing it among advertiser-prized 18-to-49-year-olds (223,258 to 73,356). Revolution then bungee-jumped to a fourth-place 89,495 total viewers in the 9 p.m. hour, losing even to CBS’ Hawaii Five-0 rerun while ABC’s new episode of Castle led the way with 240,947 viewers. Revolution inched ahead of Hawaii Five-0 in the 18-to-49 demographic, but its falloff from The Voice was huge (all the way down to 31,894 viewers). In the aftermath of the Boston bombings, viewers’ appetite for Fox’s grisly The Following may be on the wane. Monday’s 8 p.m. hour fell to 165,221 total viewers, down from 282,252 the previous week. It likewise slumped with 18-to-49-year-olds, although the serial killer drama already has been renewed for next season by Fox. The CW network’s new 8 p.m. episode of the reality competition series Oh Sit! instead assumed a horizontal position. It had a sub-measly 2,754 total viewers and registered “hashmarks” (no measurable audience) among 18-to-49-year-olds. On Fox Sports Southwest, the Texas Rangers’ late-starting, comeback win over the nemesis Angels averaged a nice-sized 192,758 total viewers. In Monday’s local news derby results, WFAA8 rolled to big wins at 10 p.m. in both total viewers and 25-to-54-year-olds, the main advertiser target audience for news programming. Fox4 scored another pair of wins at 6 a.m. and also swept the 5 p.m. competitions. WFAA8 and CBS11 tied for the top spot in total viewers at 6 p.m. while Fox4 ran first in the 25-to-54 demographic. Real-life drama from Boston Friday dominated TV screens until the apprehension of suspected bomber Dzhokhar Tsamaev was officially announced between 7:45 and 8 p.m.
Friday night’s Texas Rangers-Seattle Mariners matchup, with Yu Darvish on the mound, averaged 185,873 viewers for the entire game on TXA21. From 7 to 8 p.m., the Rangers drew 123,916 viewers. Saturday night’s Rangers-Mariners game had 172,105 viewers on Fox Sports Southwest while Sunday’s daytime face-off between the two teams (also on FSS) inched up to 178,989 viewers. Sunday’s biggest prime-time draw, CBS’ 60 Minutes, had 216,852 viewers, with the network’s The Amazing Race just a speck behind (216,164). ABC had a decent showing with its Hallmark movie Remember Sunday, which ran second from 8 to 10 p.m. Sunday with 137,684 viewers behind CBS’ The Mentalist (206,526 viewers). Among advertiser-prized 18-to-49-year-olds, Remember Sunday moved into a first place tie in that time slot with NBC’s All-Star Celebrity Apprentice. Friday’s local news derby results were skewed at both 5 and 6 p.m. by continuing live network coverage from Boston. So we’ll discount them. In the 10 p.m. competition, WFAA8 ran first in both total viewers and 25-to-54-year-olds, the main advertiser target audience for news programming. Fox4 as usual ran the table at 6 a.m.
On KTXD-TV (Ch. 47), D magazine’s 9 to 11 a.m. D: The Broadcast continued to register zeroes on the Nielsen ratings meter. Friday’s program again had “hashmarks” (no measurable audience), replicating its ratings for the entire week. CBS went wall-to-wall with prime-time reruns Thursday -- and still came away with a nice looking ratings scorecard. Fox’s American Idol held down the 7 to 8 p.m. slot in total D-FW viewers, luring 296,021. But CBS’ double dose of Big Bang Theory repeats had the most advertiser-prized 18-to-49-year-olds in both the 7 and 8 p.m. half-hours. Big Bang also beat the first half-hour of Fox’s new Glee episode in total viewers before CBS’ 2 Broke Girls reboot tied Glee for the lead in that measurement from 8:30 to 9 p.m.
At 9 p.m., Fox4’s local newscast edged CBS’ Person of Interest in total viewers and won by a dominant margin in the 18-to-49 demographic. NBC’s 9 p.m. third episode of Hannibal beat only a repeat of ABC’s Scandal in the total viewers and 18-to-49 competition among the Big Four broadcast networks. CBS11 ran first at 10 p.m. in total viewers but Fox4 won with 25-to-54-year-olds, the main advertiser target audience for news programming. Fox4 again ran the table at 6 a.m. and added 5 and 6 p.m. wins among 25-to-54-year-olds. CBS11 had the most total viewers at both 5 and 6 p.m.
Fox4’s continuous coverage of the West, TX fertilizer plant explosion and collateral damage drew the most D-FW eyeballs from start to finish Wednesday night. The station had the advantage of an American Idol lead-in and a 9 p.m. local newscast already in place. Still, it maintained its edge over rivals NBC5, WFAA8 and CBS11 throughout the late night hours. The 9 p.m. newscast drew more D-FW viewers -- 351,194 -- than the preceding two hours of Fox’s Idol (323,557). NBC5, WFAA8 and CBS11 respectively had repeats of Chicago Fire, Nashville and Elementary during that hour. WFAA8 was the first to cut away to continuous coverage of the tragedy, followed by CBS11. NBC5 aired the end of Chicago Fire before starting continuous coverage with its 10 p.m. newscast. Audience high points for all four stations came during their 10 p.m. newscasts. In that half-hour, Fox4 led with 316,673 viewers, followed by WFAA8 and CBS11 (234,063 apiece) and NBC5 (192,758). Fox4 also won every 15-minute increment from 10 p.m. to 12:30 a.m. among 25-to-54-year-olds, the main advertiser target audience for news programming. In Tuesday’s prime-time ratings, NBC’s The Voice had the most total viewers in the 7 p.m. hour before ABC’s Dancing with the Stars and Body of Proof won in that measurement from 8 to 10 p.m. The Voice and DWTS also took their time slots among 18-to-49-year-olds (principal advertiser target audience for entertainment programming) before Fox4’s 9 p.m. newscast had the win in that hour. Here are the four-way local news derby numbers for Tuesday and Wednesday. Tuesday -- WFAA8 swept the 10 p.m. competitions in total viewers and 25-to-54-year-olds. Fox4 did likewise at both 6 a.m. and 5 p.m. The 6 p.m. wins went to CBS11 in total viewers and Fox4 with 25-to-54-year-olds. Wednesday -- As already detailed, Fox4 ran the table at 10 p.m. The station also had doubleheader wins at 6 a.m. and 5 p.m.
CBS11 kept Fox4 from pulling off an exceedingly rare double grand slam by drawing the most viewers at 6 p.m. Fox4 had the most 25-to-54-year-olds in that time slot. First of all, they all should be commended. 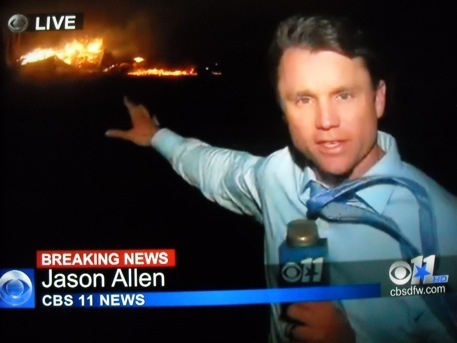 Fox4, NBC5, WFAA8 and CBS11 pretty much threw everything they had into Wednesday night’s devastating West, Texas fertilizer plant explosion. Late night entertainment schedules were thrown out in favor of continuous, commercial-free coverage. And each station acquitted itself well while individual stations at times stood out from the pack. NBC5 got a later start than it should have, sticking to the end of NBC’s Chicago Fire repeat while WFAA8 and CBS11 respectively broke into network reruns of Nashville and Elementary. Fox4 already was in sync with its regularly scheduled 9 p.m. local newscast. 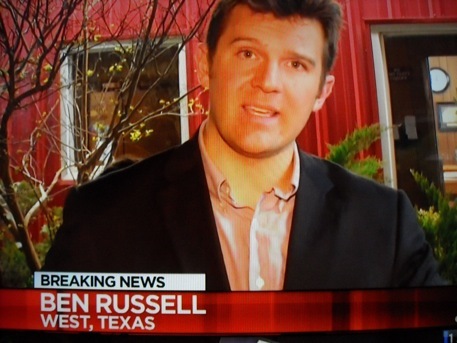 But later that night, NBC5 and reporter Ben Russell had the only live coverage of West, Texas mayor Tommy Muska’s initial media briefing. Muska’s most-cited quote -- “There’s a lot of people who won’t be here tomorrow” -- was recycled in due time by NBC5’s competitors. CBS11 anchor Karen Borta told viewers, “I did get this quote from Twitter.” NBC5 got it while it happened. Fox4 had all of its regular 9 and 10 p.m. weeknight news anchors in place -- Steve Eagar, Heather Hays and Clarice Tinsley. NBC5’s Brian Curtis teamed with anchor Amanda Guerra while his usual partner, Meredith Land, had the night off. John McCaa, half of WFAA8’s regular duo, stood out from his peers. He excelled all night as a calm, collected, reassuring presence while substitute anchor Shelly Slater mostly kept up with a steady stream of Tweets displayed in the station’s Social Media Center. McCaa’s usual anchor partner, Gloria Campos, had the night off. “This is devastation you would liken to a very serious tornado, a very serious hurricane,” McCaa said tellingly. 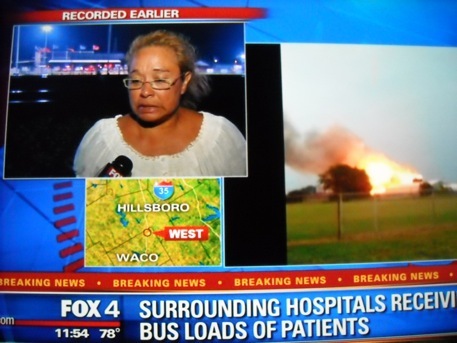 In an on-screen banner used for a good portion of its coverage, WFAA8 cited Waco’s KWTX-TV as the source of a report that 60-70 people were killed in the explosion and its aftermath. But by Thursday morning, KWTX had downsized that estimate to between 5 and 15 people dead. On CBS11, Borta turned to meteorologist Larry Mowry for support. He became an ad hoc co-anchor in the absence of Doug Dunbar or any fill-in. But reporter Jason Allen was quickly on the ground and on-camera. The above picture, of Allen pointing out a nearby blazing home, stood out in the early going. He later walked through the ruins of a badly damaged home in another vivid live shot. CBS11 newcomers Brian New and Mireya Villarreal also pitched in. Fox4 had reporters Brandon Todd and Natalie Solis in West, Texas, but both communicated mainly by telephone in the pre-midnight hours. WFAA8 deployed Steve Stoler and Todd Unger, both of whom eventually got on camera. But in the 10 p.m. to midnight portion of coverage, NBC5’s Russell and CBS11’s Allen were the standouts. On WFAA8, Slater assured viewers at one point, “I’ve got my phone in my hand, listening to your tweets.” She meant “reading,” but no one’s perfect. NBC5 likewise flubbed with a quizzical on-screen caption that read, ”Reports of People Feeling In Metroplex.” But it was soon removed. As the last to fire up its continuous coverage, NBC5 was also the first to end it. The station went to the tail-end of NBC’s Late Night with Jimmy Fallon at 12:30 a.m. while Fox4, WFAA8 and CBS11 continued to report on the tragedy past 1 a.m.
CW33’s 9 p.m., comedy-infused Nightcap -- “A Different Kind of Newscast” -- shut down at 10 p.m. in deference to a Family Guy rerun. Its three anchors, seemingly clueless and oblivious, were seen laughing and joking amongst themselves before the cartoon show kicked in. But for D-FW’s real TV news operations, a long night had only just begun. NBC’s impromptu prime-time news special on the bombings in Boston paid ratings dividends the network would just as soon not count. Airing in place of Revolution in Monday’s 9 p.m. slot, the Brian Williams-anchored hour drew 247,831 D-FW viewers to finish a close second to CBS’ competing new episode of Hawaii Five-0 (268,484 viewers). But the news special easily won the hour among advertiser-prized 18-to-49-year-olds with 118,008 viewers in that age range. Both are bigger totals than Revolution has been getting since returning in late March. Earlier Monday, Fox News Channel had the highest peak audiences among cable networks during the 3 to 5 p.m. period when news of the bombings was breaking. FNC topped out at 123,916 total viewers between 4:30 and 4:45 p.m. CNN’s high point was 48,189 viewers in the 4:15 to 4:30 segment while MSNBC’s biggest audience -- 27,537 -- tuned in from 4 to 4:15 p.m. In the broadcast network universe, Fox hit a high of 137,684 viewers from 4:30 to 4:45 p.m. ABC had the second biggest total -- 110,147 viewers in the 4 to 4:15 p.m. segment, with CBS matching that number from 4:45 to 5 p.m. NBC’s high point was 89,495 viewers from 4:30 to 4:45 p.m.
By 6:30 p.m., CBS11 was the only D-FW broadcast station still carrying its network’s national newscast. And the Scott Pelley-helmed CBS Evening News easily had the most viewers from 6:30 to 7 p.m. with 240,947. NBC5’s local newscast, which preempted Extra, had the most 18-to-49-year-old viewers, though. WFAA8’s Entertainment Tonight had by far the fewest in that half-hour. NBC’s The Voice as usual led the prime-time Nielsen parade, amassing 426,820 total viewers from 7 to 9 p.m. while also dominating in the 18-to-49 demographic. Also of note: the final two Season 2 episodes of Dallas aired from 8 to 10 p.m. on TNT. They respectively drew 137,684 and 110,147 total viewers. Any Season 3 renewal of the series is still very much up in the air after ratings sagged sharply in the Ewings’ sophomore year. The absence of Larry Hagman isn’t helping the show’s long-term prospects. In the local news derby results, only the 6 a.m. and 10 p.m. editions were unaffected by network over-rides. Fox4 again ran the table at 6 a.m. while the 10 p.m. firsts were split between WFAA8 in total viewers and Fox4 among 25-to-54-year-olds (main advertiser target audience for news programming. Sunday’s rain-soaked Masters playoff joust between Adam Scott and Angel Cabrera lit up CBS’ early evening ratings. A good part of the Dallas Mavericks’ beard shave-off game at New Orleans aired directly opposite The Masters on TXA21. It averaged 55,074 viewers but hit a high point of 103,263 in the first full 15-minute segment (6:45 to 7 p.m.) after the Masters ended. AMC’s second Season 6 episode of Mad Men drooped to just 20,653 viewers in the 9 p.m. hour, falling well short of HBO’s 68,842 viewers for its 8 p.m. episode of Game of Thrones. HBO’s Season 2 premiere of Veep then tumbled to 6,842 viewers. Saturday’s third round of The Masters on CBS averaged 117,031 viewers. The Texas 500 on Fox Saturday night drew 137,684 viewers to rank as prime-time’s top overall draw. CBS swept Friday’s prime-time Nielsens with Undercover Boss (151,452 viewers), Vegas (247,831) and Blue Bloods (254,715). TXA21’s late-starting Texas Rangers game at Seattle averaged 192,758 viewers. ABC’s Shark Tank and the first hour of the Rangers game had the edge from 8 to 10 p.m. among advertiser-prized 18-to-49-year-olds. The 7 p.m. hour was a tie between Undercover Boss and ABC’s two episodes of Happy Endings. Fox’s American Idol results show had the most total viewers Thursday night with 282,252. But among 18-to-49-year-olds, it fell to second from 7 to 7:30 p.m. to a repeat of CBS’ The Big Bang Theory. In the 9 p.m. hour, NBC’s second episode of Hannibal ran third in total viewers with 144,568 opposite Fox4’s local newscast (167,975) and CBS’ rerun of Elementary (163,844). Hannibal moved up to second with 18-to-49-year-olds, behind Fox4’s news. Thursday -- CBS11 had the most total viewers at 10 p.m. but Fox4 was tops with 25-to-54-year-olds, the main advertiser target audience for news programming. Fox4 also logged another doubleheader sweep at 6 a.m.
CBS11 ran first in total viewers at 6 p.m. while WFAA8 had the edge with 25-to-54-year-olds. Fox4 and WFAA8 shared the total viewers gold at 5 p.m., with Fox4 drawing the most 25-to-54-year-olds. Friday -- CBS11 again won at 10 p.m. in total viewers, but WFAA8 had the most 25-to-54-year-olds. Fox4 ran the table at 6 a.m. and WFAA8 did likewise at 5 p.m. WFAA8 also had the most total viewers at 6 p.m. while sharing first place with Fox4 in the 25-to-54 demographic. Fox and CBS traded punches as usual in Wednesday’s first two hours of prime-time before NBC’s repeat of Hannibal went down for the count in the 9 p.m. hour. American Idol’s latest two-hour performance show averaged 337,326 D-FW viewers, winning its first hour against CBS’ competing Survivor: Caramoan (254,715) but losing the second to CBS’ Criminal Minds (357,978). But Idol again was tops all night among advertiser-craved 18-to-49-year-olds. CBS’ CSI: Crime Scene Investigation won at 9 p.m. with 309,789 total viewers while also prevailing in the 18-to-49 demographic. NBC’s Hannibal ran a distant fourth in that time slot with just 89,495 viewers and a measly 19,136 in the 18-to-49 age range. The Nielsen numbers were likewise dismal nationally, but NBC’s saving grace for now is that this was a rerun of the series premiere. Still, these are really bad numbers for a grisly drama whose opening night numbers last week were several cuts below the competition’s. In Wednesday’s local news derby results, the firsts were shared by just two of the four competing stations. CBS11 swept the 10 p.m. competitions in total viewers and 25-to-54-year-olds, the main advertiser target audience for news programming. The station added a 6 p.m. win in total viewers. Fox4 ran the table at both 6 a.m. and 5 p.m. while also taking the 6 p.m. gold among 25-to-54-year-olds. CBS’ NCIS and NBC’s The Voice banged heads in the 7 p.m. hour Tuesday, with Nielsen awarding a split decision to prime-time’s reigning two heavyweights. NCIS had the biggest overall turnout, a whopping 557,620 viewers to The Voice’s 447,473. It was the reverse with advertiser-prized 18-to-49-year-olds. The Voice had a highly impressive 264,720 viewers in this age range compared to 133,955 for NCIS. CBS also won at 8 p.m. in total viewers with NCIS: Los Angeles (385,515). ABC ran first at 9 p.m. with Body of Proof (206,526). The respective golds among 18-to-49-year-olds went to ABC’s Dancing with the Stars results show and Fox4’s 9 p.m. local newscast. NBC’s 8 to 10 p.m. premiere of Ready For Love, yet another dating competition show, had 103,263 total viewers. Among the Big Four broadcast networks, that was good enough to beat only Fox’s 8 to 9 p.m. tandem of New Girl and The Mindy Project. But Ready For Love moved up to second place in the 9 p.m. hour among 18-to-49-year-olds, trailing only Fox4’s newscast. On Fox Sports Southwest, the Texas Rangers’ home win against Tampa Bay drew a nice-sized 185,873 viewers, with 66,977 in the 18-to-49 demographic. Fox4 again did likewise in the 6 a.m. hour while WFAA8 added a 5 p.m. win in total viewers and a 6 p.m. first among 25-to-54-year-olds. NBC5 won with 25-to-54-year-olds at 5 p.m. and CBS11 had the most total viewers at 6 p.m. Free-wheeling and fast-paced, the NCAA men’s hoops final vied with NBC’s upscale The Voice for top ratings honors Monday night. It was pretty close overall. Running from 8:26 to 10:46 p.m. on CBS, Louisville’s 82-76 win over Michigan averaged 371,747 D-FW viewers while The Voice amassed 426,820 from 7 to 9 p.m. But during their full half-hour opposite one another (8:30 to 9 p.m.), The Voice drubbed basketball to the tune of 454,357 viewers to 309,789. ABC’s Dancing with the Stars came in third during that half-hour with 268,484 viewers. The Voice also dominated among advertiser-prized 18-to-49-year-olds, luring 251,963 from 8:30 to 9 p.m. while Louisville-Michigan took the silver with 133,955. Hoops dominated the Nielsens in both measurements from 9 p.m. until closing time, with NBC’s Revolution plunging to 144,568 total viewers. That put it in fifth place behind basketball, the 9 to 10 p.m. portion of the Rangers-Rays game on Fox Sports Southwest, Fox4’s local newscast and ABC’s Castle repeat. The Rangers averaged a respectable 185,873 viewers for the entire game, which ended with a horrid called third strike that gave the North Texas Nine a one-run win. While the Rays and their manager argued at length, Rangers analyst Tom Grieve called it a “borderline call.” He said this after the FSS “Pitch Track” showed the pitch from closer Joe Nathan to be far outside. A few words about Grieve. He’s a decent man who obviously knows the game very well. But his “Homer” tendencies, particularly with ball and strike calls, are an embarrassment on too many nights. Had a Ranger been at the plate, Grieve would have griped at length about the bogus strike call. And as the post-game comments showed, no one except Grieve thought the pitch was “borderline.” That included both plate umpire Joe Foster, who admitted he blew the call, and Nathan himself. What Grieve should have said was something on the order of, “Well, the Rangers got away with one there. That pitch wasn’t really even close to being a strike. But Nathan will take it, and these things have a way of evening out.” Maybe he can make amends at the start of Tuesday’s game. OK, back to Monday’s ratings, which showed that the inaugural two-hour edition of D magazine’s D: The Broadcast registered “hashmarks” (no measurable audience from 9 to 11 a.m. on KTXD-TV (Ch. 47). The previous companion show, D Living, was dropped to make room for the expanded D: The Broadcast. In Monday’s local news derby results, WFAA8 won a downsized three-way 10 p.m. competition in both total viewers and 25-to-54-year-olds, the main advertiser target audience for news programming. Fox4 as usual swept the 6 a.m. competitions. The station also ran the table at 5 p.m. and added a 6 p.m. win with 25-to-54-year-olds. CBS11 had the most total viewers at 6 p.m.
Fox Sports Southwest has shifted its scheduled April 14th and 17th Dallas Mavericks games against New Orleans to TXA21. The respective start times are 5 p.m. and 7 p.m., with at least a slight chance that both games could be meaningful to the Mavs’ playoff hopes. 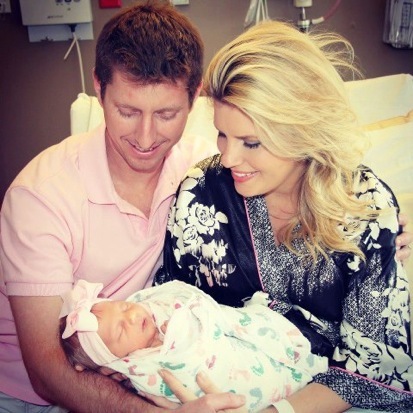 Also, NBC5 meteorologist/traffic reporter Samantha Davies is newly engaged. Here’s a link to her on-air announcement. The Texas Rangers’ first home games of the season and the NCAA’s Final Four men’s hoops face-offs made it a big sports weekend in D-FW land. Mega-booing of Josh Hamilton added to the fun at Rangers Ballpark, with three different stations in the mix. Friday’s early afternoon home opener against the Angels on Fox Sports Southwest had the smallest crowd, with 172,105 D-FW viewers. Daytime work week games are hard-pressed to draw big TV audiences, although many more viewers likely were watching in bars or other out-of-home venues that Nielsen is still challenged to measure. Saturday’s mid-afternoon game on Fox moved up to 227,179 viewers. Sunday night’s Rangers-Angels finale on ESPN2 then blew up to 323,557 viewers. Yu Darvish on the mound is still an audience magnet, even more so after his near-perfect game on FSS last Tuesday. In contrast Sunday night, mothership ESPN’s competing women’s Final Four basketball games were both air balls. Louisville-Cal averaged 41,305 viewers and UConn-Notre Dame, 27,537. There were some showy non-sports attractions, too, led by CBS’ three-hour Academy of Country Music awards show Sunday night. 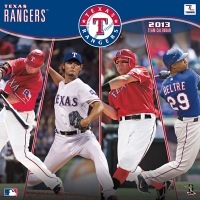 It outdrew the Rangers-Angels game with 337,326 viewers. But baseball had more advertiser-prized 18-to-49-year-olds, beating the twangers by a score of 121,197 to 111,629. On AMC, the two-hour Season 6 premiere of Mad Men had 75,726 total viewers from 8 to 10 p.m., with 44,652 in the 18-to-49 age range. HBO’s second Game of Thrones episode of the series’ third season drew 48,189 total viewers for its initial 8 p.m. showing. As with Mad Men, more than half of them -- 28,705 -- were in the 18-to-49 age range. The Friday night debut of CBS’ Vegas may have helped its chances for a second season. Airing at 8 p.m., Vegas won its time slot with 234,063 total viewers. ABC’s competing Shark Tank easily had the most 18-to-49-year-olds in that slot, though; Vegas tied NBC’s Grimm for second place while drawing more viewers in this key demographic than CBS’ following Blue Bloods. The Friday night losers, with renewals for next season very unlikely, were NBC’s Fashion Star and Fox’s Touch. Respectively airing at 7 and 8 p.m., both series ran fourth in both ratings measurements. CBS11 won in total viewers at 10 p.m. while WFAA8 ran first with 25-to-54-year-olds, the main advertiser target audience for news programming. Fox4 again swept the 6 a.m. competitions. WFAA8 notched twin wins at 5 p.m. while also topping the 6 p.m. Nielsens among 25-to-54-year-olds. CBS11 had the most total viewers at 6 p.m.
Alexis Smith, WFAA8’s Saturday morning Daybreak traffic reporter, is taking a new job as the full-time early morning traffic stopper at Seattle’s KIRO-TV. She’s scheduled to start in May. Danielle Vollmar, who vacated CW33’s Nightcap news in mid-January for a weathercaster spot at WTXF-TV in Philadelphia, has already landed a new forecasting job at Boston’s WCVB-TV. She’ll be the meteorologist for that station’s weekend editions of the early morning Eye Opener. Vollmar had been a co-host of CW33’s weekday Eye Opener before moving to the like-minded, comedy-laced 9 p.m. Nightcap . Thursday’s premiere of NBC’s Hannibal upped its audience from a dismal lead-in but still ran fourth at 9 p.m. in the major ratings food groups. The Peacock’s new adventures of the flesh-eating, serial-killing slasher drew 96,379 D-FW viewers, with 41,462 of them in the advertiser-prized 18-to-49 age range. But Hannibal inherited a measly 34,421 total viewers from NBC’s preceding Go On, which had an equally dismal 15,947 in the 18-to-49 demographic. Nonetheless, Hannibal got badly spanked by CBS’ Elementary, which won the 9 p.m. slot in total viewers with 302,905 total viewers while ABC’s Scandal was tops with 18-to-49-year-olds (70,167). Fox4’s 9 p.m. local newscast also beat Hannibal in both ratings measurements. CBS’ 8 p.m. episode of Person of Interest was the night’s overall top draw in total viewers with 413,052. And the network’s 7 p.m. Big Bang Theory drew the most 18-to-49-year-olds (188,175), easily whipping the first half-hour of Fox’s competing American Idol (114,818). Idol’s second half-hour won its time period in both total viewers and 18-to-49-year-olds. In Thursday’s local news derby results, CBS11 and WFAA8 respectively took the 10 p.m. golds in total viewers and 25-to-54-year-olds, the main advertiser target audience for news programming. Fox4 again swept the 6 a.m. Nielsens and added 5 and 6 p.m. wins in the 25-to-54 demographic. NBC5 won in total viewers at 5 p.m. and CBS11 ran first in this measurement at 6 p.m.
D-TV, broadcasting arm of D magazine and its sister publications, is adding and subtracting from its 9 to 11 a.m. programming block on KTXD-TV (Ch. 47). A memo from Kim Elenez, general manager of D-TV and publisher of D CEO magazine says that D Living is being dropped from its 10 a.m. slot, effective Monday, April 8th. But D: The Broadcast will expand from one to two hours, using a combination of hosts from that program and D Living, but no more than four at a time. That’s debatable. Since their Feb. 18th premieres, both D-TV programs generally have been registering “hashmarks” (no measurable audience) in both the total viewers and 18-to-49 measurements. Thursday’s editions showed a slight pulse, though. Nielsen says that D: The Broadcast had 2,754 viewers, with 2,870 of them in the 18-to-49-range (even though that’s not humanly possible unless some of the 18-to-49-year-olds were plants, animals or something other than human). The axed D Living drew 1,377 viewers, but had hashmarks in the 18-to-49 measurement. D: The Broadcast is hosted by Lisa Pineiro, Suzie Humphreys, Courtney Kerr and Pat Smith. D Living’s hosts have been Hillary Kennedy and Kimberly Whitman. American Idol’s latest performance show again led Wednesday’s parade among advertiser-coveted 18-to-49-year-olds, but CBS prevailed in total viewers for two of prime-time’s three hours. Idol and Fox4’s 9 p.m. local newscast swept the prime-time Nielsens in the key 18-to-49 demographic. The 8:30 p.m. premiere of ABC’s How to Live With Your Parents (For the Rest of Your Life) ran fourth across the board with 144,568 total viewers and 51,030 in the 18-to-49 age range. On Fox Sports Southwest, the Texas Rangers’ afternoon road win at Houston averaged 75,726 total viewers. It hardly bears repeating anymore, but D magazine’s 9 to11 a.m. offerings -- D: The Broadcast and D Living -- again registered “hashmarks” (no measurable audience) on KTXD-TV (Ch. 47). CBS11 ran first at 10 p.m. in total viewers but WFAA8 won among 25-to-54-year-olds, the main advertiser target audience for news programming. Fox4 scored twin wins at 6 a.m. and added a 6 p.m. gold in the 25-to-54 demographic. CBS11 had the most viewers at 6 p.m. The 5 p.m. firsts went to NBC5 in total viewers and WFAA8 with 25-to-54-year-olds. Local Nielsen ratings snapshot (Tues., April 2) -- were Yu watching? Yu Darvish’s achingly close near-perfect game Tuesday night emerged as D-FW’s most-watched TV attraction in its climactic 15-minute segment. But not as watched as one might expect. The Texas Rangers’ starter had a perfecto with just one out left to go before the Houston Astros’ Marwin Gonzalez hit a shot through Yu’s legs shortly before 10 p.m. A total of 296,021 viewers were on hand for the 9:45 to 10 p.m. segment on Fox Sports Southwest. The overall average for the game, which ended at 10:05 p.m., was 172,105 viewers. Surprisingly, the Rangers hit a higher peak crowd -- 309,789 -- and also had a higher overall average (261,600 viewers) for Sunday night’s season-opening loss to Houston on ESPN. Go figure. Tuesday night’s hit parade was led by NBC’s 7 p.m. hour of The Voice, which had 419,936 viewers and also creamed everything in sight among advertiser-prized 18-to-49-year-olds. ABC’s Dancing with the Stars won at 8 p.m. with 357,978 total viewers before the network’s Body of Proof drew 289,136 viewers in topping the Big Four broadcast network Nielsens. Both shows also won their time slots with 18-to-49-year-olds. The Dallas Mavericks’ late night swoon, a lopsided loss to the Los Angeles Lakers on TNT, averaged 117,031 viewers. In Tuesday’s local news derby results, WFAA8 won at 10 p.m. in both total viewers and 25-to-54-year-olds, the main advertiser target audience for news programming. The ABC station added a sweep at 5 p.m.
Fox4 ran the table at 6 a.m. while the 6 p.m. firsts were split between CBS11 in total viewers and Fox4 in the 25-to-54 demographic. NBC remained solidly atop Monday’s 7 to 9 p.m. ratings charts with another two-pronged edition of The Voice. Then it was all downhill. Again spanking ABC’s competing Dancing with the Stars, the Peacock sung to the tune of 399,284 D-FW viewers, with 200,069 of them in the advertiser-prized 18-to-49 age range. The respective totals for DWTS were 316,673 and 79,735. NBC’s Revolution then plunged to 172,105 total viewers, running third at 9 p.m. behind ABC’s Castle (323,557) and Fox4’s local newscast (213,410). Revolution moved into second place with 18-to-49-year-olds, edging Fox4 while still losing big to Castle. CBS, with wall-to-wall reruns, ran fourth all night among the Big Four broadcast networks. On TNT, the weekly 8 p.m. episode of Dallas had 151,452 total viewers with 66,977 in the 18-to-49 demographic. In Monday’s local news derby results, WFAA8 won at 10 p.m. in both total viewers and 25-to-54-year-olds, the main advertiser target audience for news programming. NBC5 wound up last in both measurements despite the night’s boffo early returns from The Voice. Fox4 ran the table at 6 a.m. while the 6 p.m. firsts went to CBS11 in total viewers and Fox4 among 25-to-54-year-olds. Fox4, NBC5 and WFAA8 tied for tops at 5 p.m. in total viewers, with CBS11 just a hair behind. The 25-to-54 gold went to Fox4. Well, the Rangers at times played like zombies but still couldn’t keep up with The Walking Dead. Texas’ listless 8-2 season opening loss to the Houston Astros also served as Major League Baseball’s first game of the 2013 season on ESPN. Over on AMC, The Walking Dead wrapped up Season 3 with another viscerally violent hour. Dead drew 309,789 D-FW viewers in the 8 p.m. hour, with a giant-sized bite of them -- 232,826 -- in the advertiser-prized 18-to-49 age range. The 8 to 9 p.m. portion of the Rangers game had 275,368 viewers with 130,765 of them within the 18-to-49 motherlode. Overall, Rangers-Astros (which ended at 10:08 p.m.) averaged 261,600 total viewers, making the game Sunday’s overall No. 2 attraction in prime-time behind only Walking Dead. But this comes with an asterisk, because D-FW ratings for History channel’s concluding two hours of The Bible were not available. HBO’s 8 p.m. Season 3 premiere of Game of Thrones had a puny turnout in comparison, with 55,074 total viewers and 41,462 in the 18-to-49 demographic. 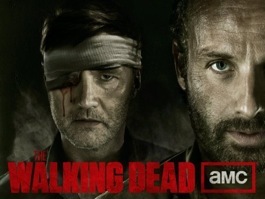 But repeats added viewers throughout Sunday night while Walking Dead likewise padded its totals. At 10 p.m., for instance, Walking Dead drew 48,189 viewers, with 41,462 of them 18-to-49-year-olds. At that same hour, Game of Thrones’ respective totals were 41,305 and 35,083. PBS also had a showcase premiere, the first two hours of Mr. Selfridge under the Masterpiece Classic banner. Starring Jeremy Piven in his first post-Entourage TV role, Selfridge had 48,189 total viewers with just 3,189 of the 18-to-49 persuasion. During Sunday’s afternoon and early evening hours, CBS had solid ratings for its two NCAA basketball tournament games. Michigan’s rout of Florida drew 172,105 total viewers before Louisville’s bashing of Duke pulled in 220,294. Over-runs and over-laps may slightly change those totals. On ESPN2, Louisville’s mega-upset of the No. 1 Baylor women’s basketball team averaged 82,610 viewers with a peak crowd of 123,916 for the closing frenetic quarter-hour. Saturday’s pair of NCAA men’s hoops attractions on CBS both drew smaller crowds than Sunday’s. Syracuse’s win over Marquette drew an average of 123,916 viewers before Wichita State’s win over Ohio State had 151,452. ABC matched the latter total with its annual rebroadcast of The Ten Commandments, which dominated the prime-time Nielsens with 151,452 viewers. OK, on to Friday, where TBS, not CBS, enjoyed the fruits of Michigan’s remarkable comeback overtime win over Kansas at Jerry’s Palace, The game, which ended at 9:05 p.m., averaged 130,800 viewers with a high point of 240,947. The second game in Arlington, a late 9:40 p.m. start time for Florida’s spanking of Cinderella Florida Gulf Coast, drew an average of 178,989 viewers with a peak of 192,758. CBS averaged 96,379 viewers for Louisville’s win over Oregon and 130,800 for the Duke victory over Michigan State. WFAA8 came very close to an exceedingly rare double grand slam, although CBS11 (its major competitor at 6 and 10 p.m. in the total viewers measurements), had those editions preempted by basketball. WFAA8 ran first at 10 p.m. in total viewers and 25-to-54-year-olds, the main advertiser target audience for news programming. The ABC station also edged Fox4 at 6 a.m. in both measurements and likewise ran the table at 6 p.m.
Fox4 spoiled the party with a narrow 5 p.m. win among 25-to-54-year-olds while WFAA8 edged Fox4 in total viewers at that hour.